Installing and running the programs in MATLAB - The fluorescence laboratory. Note: Some features in the software exploit functions only supported by newer MATLAB versions. It is recommended getting the MATLAB version in which the software was tested or simply getting the latest version of MATLAB as possible. 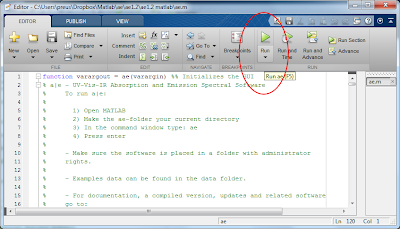 None of the MATLAB programs need to be installed but are run directly from directory. 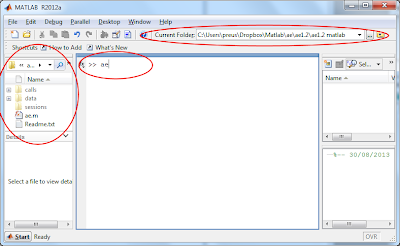 The programs automatically add the necessary folders to MATLAB's search path when loading the GUI. The paths are removed once the GUI is exited. 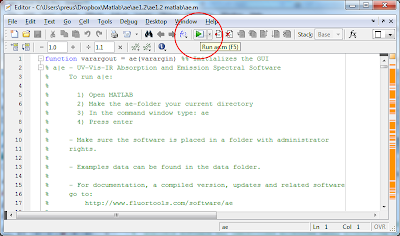 Open the main .m file of the program in the MATLAB editor (e.g. double-click ae.m for a|e, or double-click decayfit.m for DecayFit). When the file is open in the MATLAB editor press F5 to run the program (or press the green run-button in the Editor toolbar). This should open the GUI. Make the program folder your current directory. 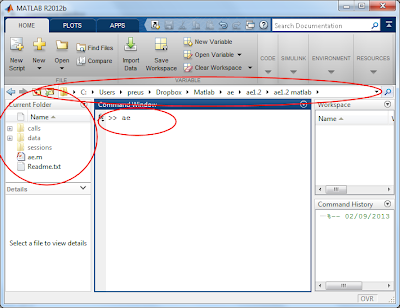 In the MATLAB command window, type the name of the main .m file associated with the program (e.g. ae for a|e, or decayfit for DecayFit). If the program does not open properly, or acts unexpectedly, you can see this page on common installation issues.